Indian Troops on the move in Kashmir against Guerrilla forces on Sep 6,1965. On the 50th anniversary of India’s 22-day war with Pakistan, we examine Russia’s role in the peace agreement, Shastri’s mysterious death, and why India agreed to end the war when it was close to a decisive victory. Although the US had supplied the F-104 and the F-86 Sabres in large numbers – virtually free of cost – to Pakistan, India’s request was rebuffed in an extremely crude manner. McNamara suggested that until India disbanded that fleet, it was no use acquiring any sophisticated aircraft. Russia, which was following the events with deep interest, maintained its traditional stand that Kashmir was part of India. Pradhan writes Moscow accepted the disturbances in Kashmir had been created by infiltrators from Pakistan. Russia also backed India at the United Nations. 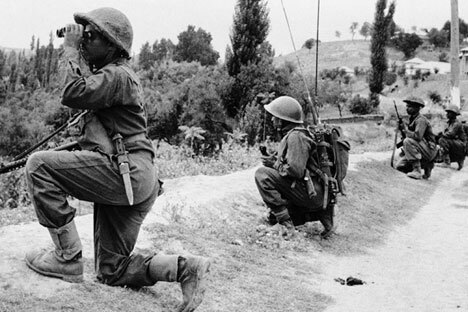 K. Vijaykrishnan writes in ‘The Soviet Union and the India-Pakistan War, 1965’, “Support was available for India on some important technical points and objections India had raised,” he says. Russia supported the Indian position that the Security Council should only deal with "questions directly connected with the settlement of the armed conflict” and not drag in the Kashmir issue. China got the message and backed off despite Pakistani appeals for help. Chinese strongman Mao Tse-Tung was reported to have told Ayub Khan that "if there is a nuclear war, it is Peking and not Rawalpindi that will be the target", writes G.W. Chaudhury in ‘India, Pakistan, Bangladesh and the Major Powers: Politics of a Divided Subcontinent’. On the night of January 10, 1966, the diminutive Prime Minister but a giant among men died of a heart attack. It was his fourth cardiac seizure and was likely triggered by his anxiety at having to face an irate public and having to look into the eyes of his jawans – soldiers – whose hopes he had dashed. Why did India stop fighting when it had Pakistan reeling? Why did Chavan and Shastri, who swatted away western pressure and gave a free hand to the Indian military, cave in? The problem was army chief Jayanto Nath Chaudhuri. The Kolkata-born general came from an affluent background and had become army chief purely on the back of family connections and pure luck. He was elevated following the resignation of another Sandhurst-educated general, Pran Nath Thapar, the army chief of the 1962 War. Chaudhuri’s mentors were the Sandhurst educated British generals – who had utterly failed before the Germans and Japanese during World War II – and predictably he also lacked war fighting qualities. “He was so good on paper that Chavan often wondered how good he would be in warfare,” writes Pradhan. Chavan mentions in his war diary that Chaudhuri would frequently lapse into depression. Each time the Indian army suffered a setback, the general would walk into the Defence Minister’s room, and Chavan had to give him a pep talk. Chaudhuri so completely lacked courage that Chavan often forced him to visit the front and personally take stock. In contrast, Pakistan had expended 80 per cent of its ammo. It had also lost 250 of its latest US-supplied tanks. In fact, when the Pakistan Army attacked in the Khem Kharan sector in Punjab, Chaudhuri ordered the Army Commander Harbaksh Singh to withdraw to a safer position. The commander refused, and what followed was the Battle of Assal Uttar – the greatest tank battle since Kursk in 1943. The Indian counter attack on the night of September 10 was so ferocious that by the morning they had knocked out 70 Pakistani tanks. But what the Battle of Assal Uttar will be memorable for are the 25 enemy tanks found abandoned with their engines running and wireless sets on. It was the perfect metaphor for the plight of the Pakistan Army. Had India kept its head, today we’d have a lot more to celebrate.